Anthony’s Chophouse recently opened in downtown Carmel, Indiana. The chef-inspired menu combines unique steakhouse cuisine with a modern fine-dining decor. A custom linear see-through gas-burning fireplace with a 120″W x 24″H viewing area handcrafted by Acucraft Fireplace Systems separates two dining areas. Now they enjoy two fireplaces for the price of one! Before connecting with Acucraft Fireplace Advisor Jill Kubitschek, Architect Jeannie Marrugo of PHÄNOMEN Design had contacted several other fireplace companies. Acucraft was the only fireplace manufacturer able to achieve Jeannie’s original design intent. Jeannie had envisioned a single linear see-through gas fireplace that would burn brightly in two separate dining areas. So, she recommended Acucraft to Garmong Construction Services who was working on the Anthony’s Chophouse project. Next, Acucraft Fireplace Advisor, Jill, and the Acucraft Design Team worked with Project Manager Alaine Vanderford of Garmong Construction Services. Through collaboration and value engineering, modifications were made to the original design intent to fit within their budget. After design approval, the Acucraft Production Team began handcrafting the custom linear see-through gas fireplace. Acucraft Project Manager Chad Mackrell oversaw the project through the process of fabricating, welding, finishing, performance and safety testing, crating, and delivery to Carmel for installation. “Your peace of mind for a lifetime of happy burning is what drives us,” says Acucraft Owner Chris Maxson. That’s why in 2017, Acucraft became the first fireplace manufacturer in the world to conduct internal quality, performance and safety lab testing that is certified by 3rd-Party LabTest Certification, Inc..
Video: Anthony Chophouse custom linear see-through gas fireplace undergoing Acucraft’s performance and safety testing. Acucraft works directly with our customers to provide a world-class experience and exceed their expectations. We deliver innovative solutions, revolutionary designs, use the highest quality materials and components, rigorously lab test units for performance and safety, and meet lightning-fast response times. Each truly unique fireplace system is backed by the Acucraft Lifetime Guarantee. Now that’s peace of mind for a lifetime of fireplace enjoyment. The finished custom linear see-through gas fireplace looks amazing from both dining areas! 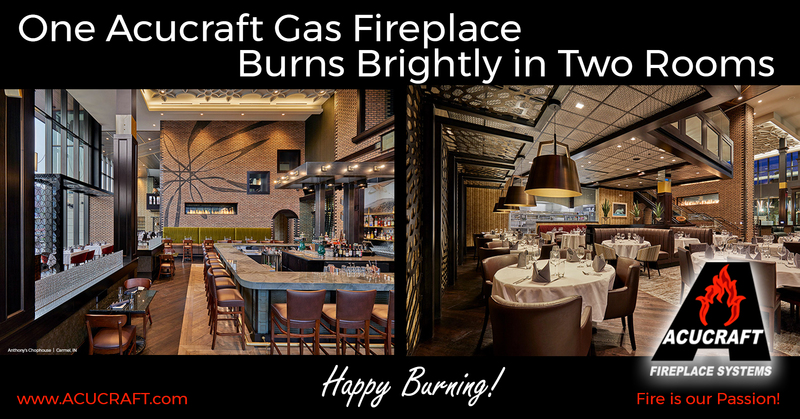 Acucraft thanks PHÄNOMEN Design and Garmong Construction Services and wishes Anthony’s Chophouse for success and many years of Happy Burning! Have a Unique Fireplace Design Idea in Mind? Acucraft Fireplace Advisors and Designers will work with you one-on-one to bring your fireplace design intent to life. Acucraft handcrafts every fireplace—idea to done. We provide you with a high-quality, high-performing, safety-compliant gas fireplace that produces the tallest, most beautiful flames on the market that you’ll enjoy for a lifetime of happy burning! Learn more about Acucraft’s Custom Gas Fireplaces or talk with an Acucraft Fireplace Expert today: 888-317-6499 or info@acucraft.com.